Tommy passed away peacefully on the 28th May. Tommy came into the Scarteen Kennels at the age 14 and never left. His father, Jack, was kennel huntsman before him. Hunting, racing, greyhounds and the G.A.A. were his interests and his life. He won a junior All-Ireland Hurling medal for Limerick. Today’s celebrity culture doesn’t sit too well with those of us with some years behind us. When we were growing up heroes were real heroes with qualities that had more depth and sincerity than we might find nowadays. When we were growing up Tommy was our idol, our hero. Sincerity, integrity, dedication, loyalty and an inherent knowledge on hunting he would share and explain to those close to him. I came home from school one day with a rather poor end of year report. Dad called me in and the first thought that came to him has stayed with me. Why can’t you be more like Tommy. Work hard, play hard. Tommy has been such an example and inspiration to us all. The master of understatement. 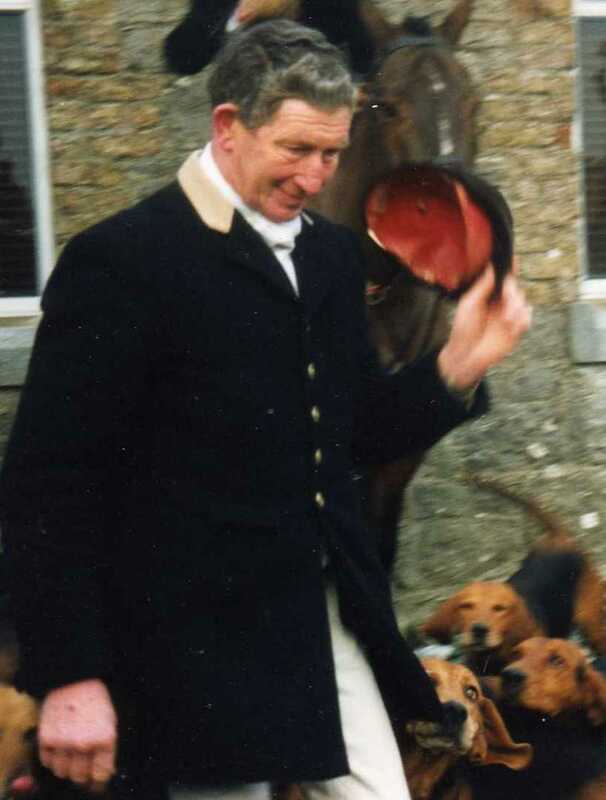 Tommy’s loyalty to his family and many friends, to his hounds and to his horse was fundamental to his life. It was automatic and guaranteed. In return for his affection and respect, his hounds and his horse would perform to their limits. He had an empathy and feel for crossing country which will never be equalled .He knew every farmer, farm, ditch and bank in the country. He and PP Hogan were most probably the best horsemen to hounds ever born. After the best of hunts, Tommy’s horse would have hardly raised a sweat when all around him horses were spent. His quiet way with hounds was exemplary. He could have hunted any pack in the country, and the offers were there. but chose to stay loyal to these lads. The twinkle in his eye and his smile will live with us always. He taught us the value of trust and respect. Trust your hounds and trust your horse and trust those about you. You might get let down once but it doesn’t happen again. He had to carry me that season and ever since. I got a text from someone on hearing the sad news. It read… you know there are hounds in Heaven…. I know they have to be Scarteen hounds and Tommy is with them. To his wife, Annette, and his sons John and James we offer our sympathy.